The Royal Mews was built by Nash in the 1820's as the Mews for Buckingham Palace. The entrance off Buckingham Palace Road is through a Doric archway surmounted by a clock tower, taking you into the quadrangle. The east side is occupied by the state coaches, and on the West and North sides are some of the best stables in existence. Behind the quadrangle are the state and private motor cars. 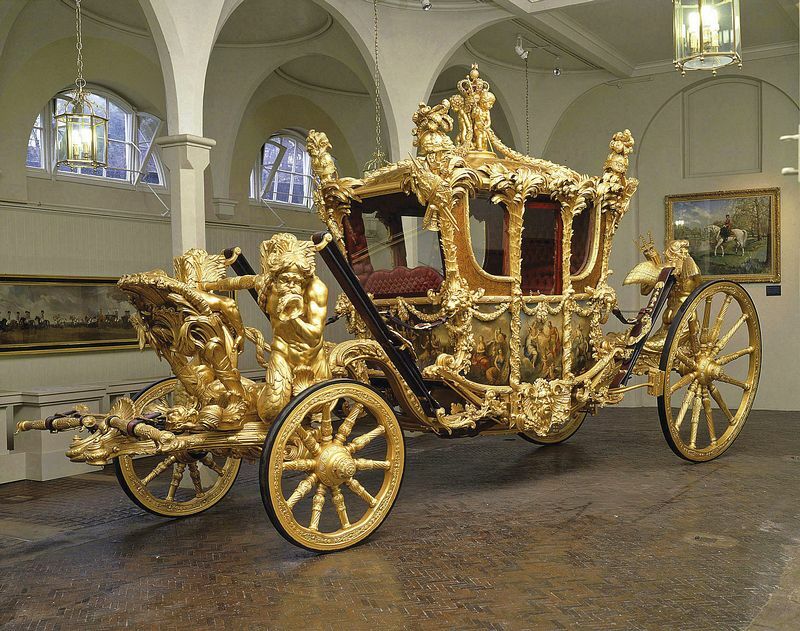 The breathtaking Gold State Coach which takes eight horses to pull it, was built for George III in 1762. Weighing four tons, it is gilded in 22 caret gold with decorations symbolic of Britain. Giovanni Battista Cipriani, a Florentine historical artist, executed the painted panels. The coach has been used for every coronation since that of George IV. For the first time in its history, it was regilded for Her Majesty The Queen's Silver Jubilee on June 7th 1997, when the Gold State Coach was used in the procession to the thanksgiving service held in St. Paul's Cathedral. Other famous coaches on view are The Irish State Coach, used by the Queen for the state opening of Parliament, the state Postillion landau used by the Queen to meet visiting heads of state and The Glass Coach, used for all the Royal weddings. On view also are barouches, chaise, wagonettes, phaetons and even sleighs. George I began importing horses from Hanover in 1714, these were the famous Creams used by the sovereign on high state occasions, they were bred at Hampton Court until 1920. Over the years, horses have been brought from Holland, France, Morocco and Spain. Two breeds of harness horses are in use today; the Cleveland Bays and the Windsor Greys. The riding horses and polo ponies are housed at Windsor Castle. This is surely the finest collection to be seen today. Liveries for state, semi-state, every day and even for Ascot, all in regal colours, can only be marvelled at. The Harnesses, some dating back to the 18th century many decorated with brass ornaments, make up a very fine collection. Nearest Undeground stations: Victoria, St.James's Park and Green Park.